The Romance Cover: Kahlen Aymes Competition ~ You really dont want to miss this! Kahlen Aymes Competition ~ You really dont want to miss this! 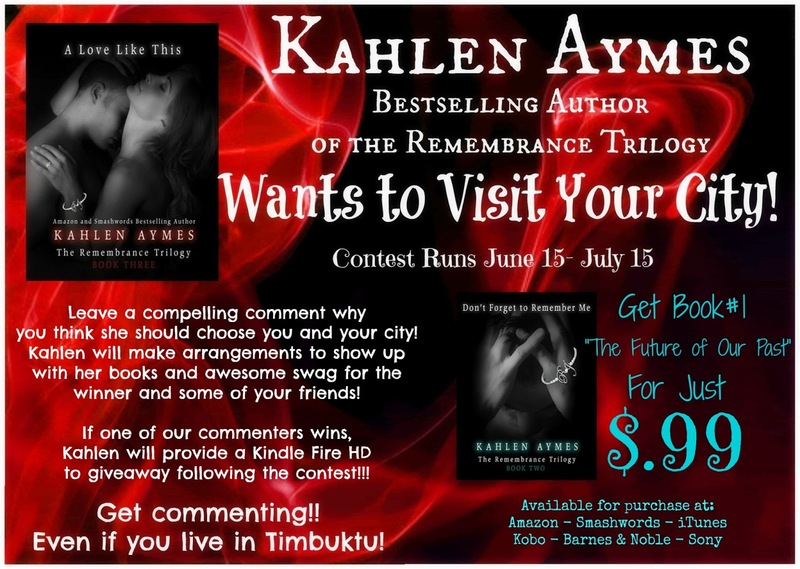 Kahlen Aymes author of the amazing and beautiful Remembrance Trilogy has this awesome contest going on! Leave a blog post comment between now (15th June) & 15 July saying why you think Kahlen Aymes should visit you and your city - and yes people this is international!! Each blog taking part will then select the best comment from their blog and will forward it onto Kahlen's team. Kahlen will then select a winner from those comments and will then go to the winner's city with her books and awesome swag for the winner and some of their friends! See I told you that you wouldn't want to miss this! An that's not all - book one ~ The Future of our Pasts is on sale right now, so no reason to not to start this beautiful trilogy if you haven't already! We will be putting our review up of book three ~ A Love Like This on 24th June along side the release party. A Love Like This is actually out now so go buy a copy! There will be loads of prizes up for grabs! Chicago! because Ryan loves to visit chicago! Chesterfield, Mi because it is beautiful here and we love to read here! Chesterfield, MI because it is beautiful here and we love to read! New Orleans, the best city ever! Best food, best drinks, best bars!!!! Phoenix because I loved your books. New Jersey!! So close to where Ryan and Julia already are but the hospitals are safer! And Julia's commute to her job would only be half an hour!! Plus who wants to raise kids in the city! Boston MA becasue our City ROCKS!! Myrtle Beach, SC because not only is it a great vacation destination, it is also where your biggest fan lives! ME!!!! I absolutely love Ryan and Julia's story and would love to meet the creative genius who created this! Gaylord, MI - for several reasons. First we have a fantastic elk park inside the city limits and everyone needs to see an elk in the wild at least once in their life. Second, Gaylord, MI looks like it has been transported here from the Swiss Alps. Third, we have an absolutely fantastic Indie bookstore on Main Street who does regular book signings and I'm sure they would be thrilled to host you for a book signing as well. Fourth, the best reason of all... in less than 90 minutes you can dip your toes into three of the Great Lakes. Tricia Anderson: Oh i would love for her to come to my little town of McHenry Illinois we dont even have a book store here in town the only author events that come near me is an hour and thirty min drive and i usually cant make them do to work. Plus it would be a great vacation for her lots of things for her to see and do she could even take a drive into Chicago after her visit here. i can take her to a dairy farm that's near my house or a rodeo Plus the chance to meet her would be a dream come true!